It hasn't taken long to see Johnny Manziel's impact with the Hamilton Tiger-Cats. 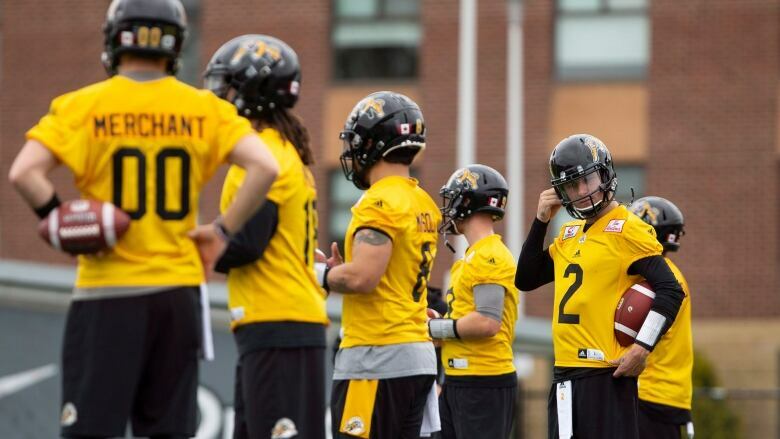 Roughly 200 fans took in the opening day of the CFL team's training camp at Ron Joyce Stadium, which also happened to be Manziel's first practice with the Ticats after signing with the club Saturday. Johnny Manziel spent much of the first day of the Hamilton Tiger-Cats' training camp as an observer. The former Heisman Trophy winner watched a lot of Sunday's session a day after signing with the CFL club. The six-foot, 210-pound Manziel threw while working with the five other quarterbacks and did short tosses to receivers but knelt off to the side or stood with quarterback coach Dan Morrison during both the one-on-one pass drills and seven-on-seven session at Ron Joyce Stadium. Ticats head coach June Jones said the slow approach with Manziel was by design. "That's because he doesn't know the terminology, he doesn't know anything," Jones said. "Dan was walking through each route as it was called. "But [on Monday] guess what? We're going to walk in and start taking a couple." Manziel, 25, is attending his first pro training camp in three seasons. A 2014 first-round pick of the Cleveland Browns, Manziel was released in March 2016 after posting a 2-6 record over two tumultuous campaigns. Hamilton's other quarterbacks include starter Jeremiah Masoli, CFL veterans Vernon Adams Jr., and Bryant Moniz along with youngsters Dane Evans and Chris Merchant of the Vanier Cup-champion Western Mustangs. Jones said the Ticats aren't waiting for Johnny Football to become familiar with their offensive terminology and schemes. "He's got to catch up because we've got guys in there and he will," Jones said. "We have plenty of time in camp. "I'd say in two-and-half-weeks he'll have a handle on everything." Manziel admitted Saturday he has plenty to learn about Canadian football. Standing on the field for the first time only served to further drive that point home for the former Texas A&M star. "Spacing is a little bit different on the defensive side if I had to look at anything," he said. "On offence, I've never ran this many routes that are predicated off of one defender … every route has an opportunity to break three or four different ways, which is different. "But I think it gives you the versatility and offensive weapons to be able to attack coverages more intensely than it would just running a fixed route. I know it's going to take some time but now I see it moreso and my expectations are tempered." Masoli showed no signs Sunday of being fazed by Manziel's presence. In fact, he tried helping the CFL rookie when he had the chance. "If the organization is going to sign you, you're here to help us win," Masoli said. "I'm here to help you get better and just try to be a good teammate. "[Manziel] is a great talent, but not only him but Bryan, Dane and Vernon. We're all pushing each other." Manziel's arrival in Hamilton has certainly boosted interest in the team. More than 200 fans took in the opening of training camp, which is roughly double the norm. And Manziel made it clear he plans to be accessible to Ticats supporters. He accommodated every autograph request following practice. "I plan on spending a lot of time here, I don't plan on really going anywhere else so it's definitely important to me," he said. "I'll take care of these guys [fans] like I would if I was anywhere else." Manziel has also endured off-field issues. In April 2016 a former girlfriend accused him of assault, and the misdemeanour assault charge was dropped after Manziel attended an anger management course, a domestic violence victim panel and substance abuse program. Manziel has also divulged he's been diagnosed with bipolar disorder that he takes medication for and has candidly discussed his alcohol use while battling depression. To his credit, Manziel addressed his past indiscretions on Sunday. "I've been very upfront with my past and the fact that I haven't been perfect by any means," he said. "Obviously the magnitude of my mistakes in the past are something I'm definitely not proud of but at the end of the day I feel like I've come a long way from that person that I was at that time. "I feel I've grown a lot and feel through the mistakes I've made they've turned me into a better person, they've turned me into a man. I'll never be able to outrun my past … the only thing I can do is grow and hopefully be a better person moving forward and I have every intention of doing that."